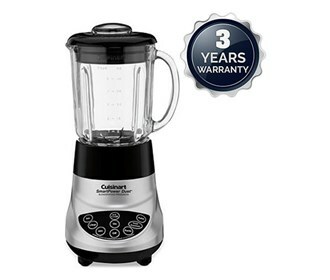 The Cuisinart BFP-703BC is a speed blender/food processor which features 350-watt motor and this unit saves space and tackles wide range of cooking tasks. It has 7 speed electronic touch-pad controls with indicator lights. This Blender comes with 3-cup food processor attachment. The Duet Blender/Food Processor Brushed Chrome has many exciting features for users of all types. You can extend the lifetime of your Duet Blender/Food Processor Brushed Chrome with the purchase of a FactoryOutletStore Factory Protection Plan. See the Duet Blender/Food Processor Brushed Chrome gallery images above for more product views. The Duet Blender/Food Processor Brushed Chrome is sold as a Brand New Unopened Item.